The final of the 2017 Wimbledon Championships will be contested on Saturday afternoon between the number 10 seed, Venus Williams and the number 14 seed, Garbiñe Muguruza after both players won straight set semi-finals on Thursday. Williams and Muguruza have both competed in a Wimbledon final before – Muguruza made it this far in 2015, while Williams is into her ninth, but her first since 2009. The first of the semi-finals lasted 65 minutes as Muguruza produced a ruthless display of attacking tennis. This was Magdalena Rybarikova’s first ever Slam semi-final and sadly that showed. She struggled to get her feet moving at the start and didn’t look comfortable with her ball toss on serve. It’s totally understandable and shows the grandeur of playing a Wimbledon semi-final. Muguruza was sporting heavy strapping on her thigh, but appeared OK in her movement. I thought both players looked nervous at the start but Muguruza kept things steady and was the more aggressive, making many ventures into the net with Rybarikova a tad defensive and reactive. Muguruza didn’t do anything special in the first set but her willingness to come forward was key – the Spaniard won 10 of 13 points up at the net. The second set was a dazzling display from Muguruza and her stats were sensational – three points dropped behind her serve, nine out of 12 points won up at the net and 14 winners to just two unforced errors. This was a great tournament for Rybarikova, who played so, so well to get this far and warranted her place in the last four. On the day, Muguruza’s experience and superior level prevailed. In another clutch display, Venus Williams edged a tight and thrilling opening set, before easing through the second set to beat Johanna Konta. It was a quality first set and I was so impressed with how both players managed to get themselves out of trouble on serve – Konta was at 30-30 in her first four service games and won that point on all four occasions before eventually holding serve. Williams was three times down *15-30 and all three times delivered on serve to hold. Williams went down *15-30 again on her serve at *1-1 in the second set, but once again held strong. Williams, who returned aggressively throughout, made the breakthrough in the next game after Konta had done well to save two break points. The Brit’s forehand broke down increasingly in the second set and she just couldn’t make a meaningful impact on return. Williams’s serve was once again, stunning, and she produced a handful of terrific body serves, one which nearly took out Konta! The serve was key in this match – Williams won 79% of first serve points (compared to 64% for Konta) and 65% of second serve points (compared to 33% for Konta). Venus’s smile at the end was absolutely infectious and she’s into her second Slam final of the year! Head-to-head record: Williams leads Muguruza, 3-1 in their head-to-head. The pair last played in Rome earlier this year where Muguruza won, on her favoured surface of clay, in Rome, 6-2 3-6 6-2. Interesting stats: Looking at the stats for all of their matches on the Wimbledon site… Williams has won a higher percentage of points behind her first serve this tournament (80% compared to 73% for Muguruza), while Muguruza has won a higher percentage of points behind her second serve (56% compared to 52% for Williams). While Williams has won a higher percentage of points up at the net, Muguruza has been more active coming forward, playing 129 points up at the net and winning 92 of those points – over 40% of those points came in her fabulous win over Kerber in the fourth round. Winners and unforced errors are remarkably similar – Williams has hit two more winners (143 to 141 for Muguruza) and Muguruza has hit one more unforced error (106 to 105 for Williams). The pair have been equally solid at saving break points. Williams has been broken just six times, while Muguruza has only lost her serve four times and three of those came in the Kerber match, which was the last time she was broken on serve. Final thoughts: In terms of attention, Konta reaching the final would have great in terms of building interest in women’s tennis in this country (Konta-Halep was viewed by 7.4 million earlier in the week!). However, Williams-Muguruza was, in my opinion, the most exciting prospect of the four possible final line-ups. There was uncertainty around both players heading into the tournament as Williams handled off-court issues and was tearful during her first press conference, while Muguruza’s final match before Wimbledon was a 1-6 0-6 thumping in Eastbourne by Barbora Strycova. I think that Williams and Muguruza have been the two best players throughout the tournament by quite some distance, and it’s a fitting finale to what has been an exciting women’s tournament. Williams has most impressed me with her serve and ability to handle some of the heaviest hitters on tour with her wealth of experience, while Muguruza has found the balance between defence and attack, and shown an increased willingness to come forward to the net. I think this could be a pretty damn great final. Williams obviously has the far greater experience, but Muguruza has been at this stage of the tournament before and is a Slam winner too so I wouldn’t anticipate her to be phased by the situation. Most impressively, both have been so mentally tough in the crux moments. As to a winner, i’ll admit again that I am struggling to separate them because they have both played so, so well during this tournament. I am going to stick with Muguruza as champ. I was strangely high on Muguruza’s chances of a deep run pre-tournament and after watching her produce a superb display to beat Sorana Cirstea in the 3rd round last week, I sensed she was looking very dangerous in this draw. Her intensity and aggressive baseline play has been on it from the first round and her ability to stay positive in the key moments has been exceptional. While I like both players, I will be rooting for Venus. She’s an absolute inspiration for what she continues to do on the court and it would be an incredible moment if she could win this title. I still feel what Venus has managed to achieve, over her entire career but most notably in the last few years, has been underrated and I can’t begin to describe the respect that I have for her. Here’s hoping for a competitive final… can’t wait for this one! I think whoever wins the first set wins in straights. My prediction was for Muguruza and Im going to stick with her. I just think shes got a little more fire and fight at the moment. Nah…it is most likely a 3 setter match. It should be a thrilling final for sure. Garbine will do some damage (that is, win a set) if she maintains her level, which has been over the top. However, I just can’t see Queen Vee losing this one. She will draw upon every ounce of her experience & talent to take home GS #8, and I think that will prove to be just too much experience & too much talent for Garbine. As always, thanks for your efforts in providing such a thoughtful analysis of women’s tennis! Thanks so much, Jamsen! Don’t disagree, both have been playing so, so well. Sticking with Garbi. Go Vee, this tournament means so much to her. I hope she wins and keeps the Williams legacy rolling. Muguruza just has a good draw in Wimbledon without any resistance. Also, Rybarikova collapsed in any big moment like in the past. Perhaps the SF prize money is just good enough for her. Muguruza has not played any player could actually match her games so far in this tournament. Venus will give her a big shock in the final. Venus for the win. If she wins she’ll have beaten 3 top ten players… all three are multiple Slam champions… how much tougher does it get?! As much as I’d love to see Venus win I think that serve won’t save her this time around. 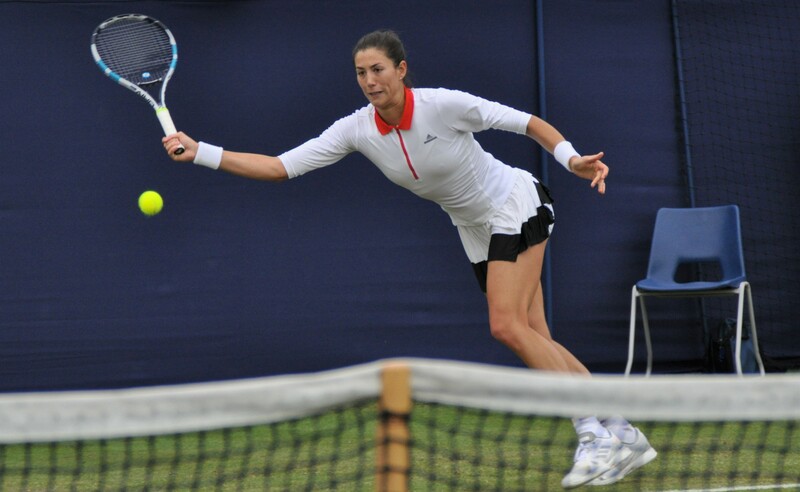 Garbine will be too young and too determined (if only to show Sumyk she’s better off without him!). Will play aggressive tennis and dominate old American. Easy 2 sets I’m afraid………………………..
Two Asian-American girls are in The Big W junior finals, Li and Liu. Thankfully Grammatikopoulou and Teerachodjiranon didn’t make it. Two fingered typist all over the world are happy that Li and Liu are in the finals. Watching some of the ITF from Budapest . Great camera angle. One fixed camera, in effect, about 8′ above the surface and about 10′ behind the baseline. This gives a much better picture than most of the other tournaments and covers about 99% of the action. The other tournaments the camera is too far back, which covers 100& of the play but greatly reduces the detail one gets from the closer camera. I’m five fingered so indifferent, but I’m going for Liu. I’m really looking forward to this match but still undecisive about who’s going to win. I have a feeling that this match could be similar to the one Petra and Venus had in 2014, in terms of power as they are both playing really well! I’m really hoping for a great match. I’ve got a good feeling since both have played so, so well this week but we’ll see! I think Muguruza will get this but I can see it being an epic like the 2005 final! final in 2015, win in 2016, final in 2017, win in 2018, final in 2019. If this occurred Muguruza would also be capped at 2 slamsin the 2010s like every player besides Serena. Both deserving finalists! Like them them both. Played excellently throughout the tournament. Will be pulling for Garbine, just because.. Venus is already in the pantheons of Wimbledon lore. A win here is just a crown on a crown so to speak. Going for Vesnina/Makarova over Niculescu and her partner. Hopefully, BMS and Lucie get another chance sometime for their doubles ‘complete’ slam chase. Now, the donot disturb sign is on my door, please it is time to go watch some tennis!!! Picked Konta, lost. Picked Venus, lost. Night and Day is womens tennis. I can accept a loss, but what I don’t understand is getting blanked the second set. That I will not accept. It’s like both Konta and Venus gave up after the first set. Ostapenko or Simona would of kept fighting. That is all. It happens a lot when two big hitters play that the first set usually determines the match. I think it simply comes down to whoever can get into a rhythm first and is able to take charge of the match wins it.